The Florida Public Service Commission next week could approve a proposed settlement that would lead to increased base electric rates for customers of Gulf Power Company. Commission Chairman Ronald Brise has approved adding the issue to a regularly scheduled meeting Tuesday, and Commissioner Lisa Edgar — who has been overseeing the rate case — said that was the PSC’s plan for considering the settlement. The Pensacola-based utility and representatives of consumers and business groups finalized the proposed settlement last week. Gulf Powerwould be able to increase base electric rates by $35 million in January and an additional $20 million in 2015. Originally, the utility had sought to increase base rates by $74.4 million, along with another potential $16.4 million 2015. Several parties opposed the full rate hike amount, including the state Office of Public Counsel, which represents consumers in utility issues; the Florida Industrial Power Users Group, which represents major electricity users; federal government agencies that are Gulf customers; and retailers Wal-Mart Stores East, LP, and Sam’s East, Inc.
Gulf Power said over the next three years the company is building and replacing power lines and infrastructure — some more than 70 years old — to keep electricity flowing to its 430,000 customers. 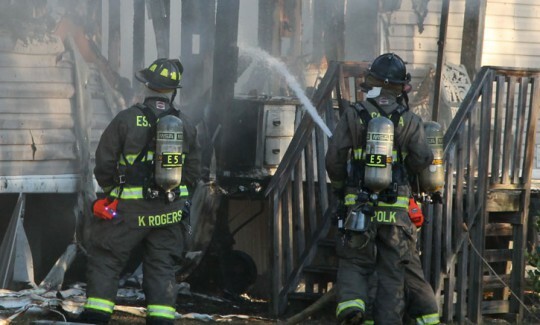 In addition, new lines and equipment are needed to comply with new mandatory federal environmental regulations. Part of the new transmission line construction is to help the company comply with new federal environmental regulations that will change the way the company operates its plants and will require plants to be shut down at regular intervals. The new lines and equipment will be used to ensure voltage stability and reliable power flow while the plants are offline. 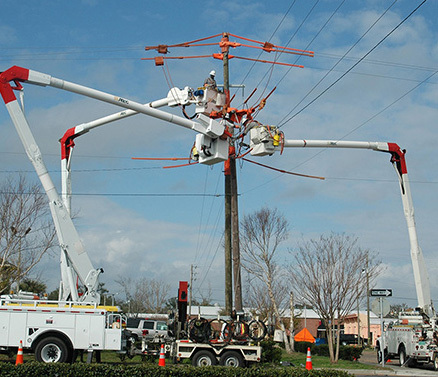 Pictured inset: Gulf Power crews making upgrades to a distribution line. Submitted photo for NorthEscambia.com, click to enlarge. Saturday: Mostly sunny, with a high near 63. Northeast wind around 5 mph. Saturday Night: Partly cloudy, with a low around 38. Calm wind. Sunday: Mostly cloudy, with a high near 65. Calm wind becoming north around 5 mph. Sunday Night: A 20 percent chance of showers. Cloudy, with a low around 47. Calm wind. Monday: A 20 percent chance of rain. Partly sunny, with a high near 69. Calm wind becoming west around 5 mph in the afternoon. Monday Night: Partly cloudy, with a low around 43. Calm wind. Tuesday: Mostly sunny, with a high near 68. Calm wind becoming south around 5 mph in the afternoon. Tuesday Night: Partly cloudy, with a low around 46. South wind around 5 mph becoming calm. Wednesday: A 20 percent chance of showers. Mostly sunny, with a high near 71. Wednesday Night: A 20 percent chance of showers. Mostly cloudy, with a low around 51. Thursday: A 20 percent chance of showers. Mostly cloudy, with a high near 72. Thursday Night: A 20 percent chance of showers and thunderstorms. Mostly cloudy, with a low around 55. Friday: A 30 percent chance of showers and thunderstorms. Mostly cloudy, with a high near 72. The Northwest Escambia Juniors are competing in the Gulf Coast Youth Football Championships in Gulf Shores this weekend. Friday, the NWE Juniors beat the Eight Mile Giants 13-0. For the NWE Eagles, Jayden Jackson and Jaheem Durant both scored touchdown, and Kaden Odom added an extra point. The Eagles defense dominated the Giants. Keaundre Richardson had five tackles and a sack, Kaden Odom had one interception and several tackles, Ki-Jana Carter, Donovon Davis and Tomorrion Knight played tough on the defensive line, AJ Hasty had a fumble recovery, and Jayden Jackson and Jaheem Durant both had several tackles. Shortly after the NWE Eagles win, tournament officials disqualified the Giants for two ineligible, over-age limit players. The NWE Eagles will take on Trimmier Park on Saturday. The Flomaton Christmas Parade will be held at 10 a.m. on Saturday, December 7 with a route through the downtown area. The 11th Annual Molino Christmas Parade is set for Saturday, December 7 at 11 a.m. The parade route starts at the west end of Crabtree Church Road and ends and the Molino Ballpark where Santa Will be waiting to visit with all the good little boys and girls. Donations such as toys and non-perishable food can be dropped off at Fran’s Diner. The parade rain date will be Sunday, December 8 at 2:30 p.m.
Century will hold a Land to Lake Lighted Boat Parade on Thursday, December 12 at 5 p.m. The parade will begin on Front Street, travel to Jefferson, Pond Street and West Highway 4, ending at Lake Stone. The Poarch Creek Christmas Parade will be Friday, December 13 at 5:30 p.m. The parade will begin on the Poarch Creek Reservation at the Wellness Center (gym) and end at the PCI Health Department Building. The Brewton Christmas Parade will be at 2 p.m. on Saturday, December 14. The parade will travel from Forrest Avenue in East Brewton, across the Mildred Street Bridge to St. Joseph Street to Belleville Avenue. 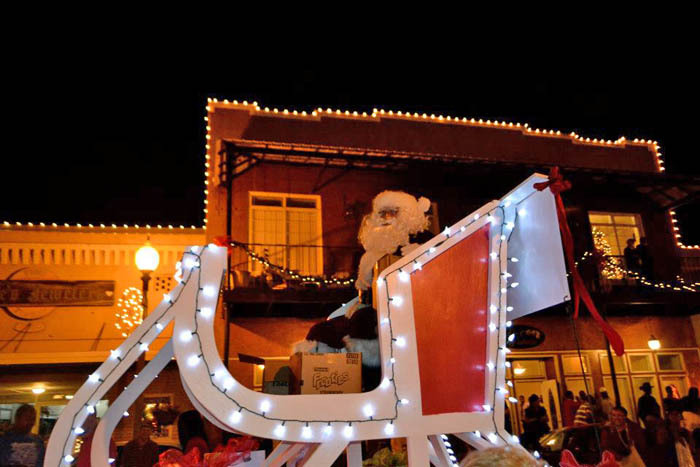 The Atmore 2013 Twilight Christmas Parade will be held Saturday, December 14 beginning at 5:30 p.m. The parade will follow its traditional route from the Atmore City Hall, down Main Street, to Lindberg Avenue and ending at Escambia County High School. Over two dozen floats are entered, along with several bands and numerous other groups. Parade participants should be at the Atmore City Hall by 4 p.m. The Chumuckla Redneck Christmas Parade will be Saturday, December 14 at 1 p.m. The parade will begin at the Cotton Gin on Chumuckla Springs Road/Gin Road, cross Chumuckla Highway and end at Salter Road. More than 250 units are expected along the 1.5 mile parade route. The Pensacola Christmas Parade will be held at 5 p.m. on Saturday, December 14 in downtown Pensacola. Featuring local bands. Parade begins at Spring and Garden and travels through downtown. Pictured top: Santa arrives during the 2012 Atmore Christmas parade. NorthEscambia.com file photo, click to enlarge. In partnership with the West Florida Public Library system, the Friends of the Library will host a book sale from Sunday, December 1, to Saturday, December 7. Books of all kinds will be available for purchase at 50 percent off and will be held at the book stores within the Tryon Branch, 1200 Langley Avenue, Pensacola, and the Main Library, 239 North Spring Street, Pensacola. All profits will support the West Florida Public Library system, including the Main, Tryon, Century and Molino branches. For more information about the fundraiser, contact Linda Williams at (850) 494-1326. Tate High School senior Noah Heintz will represent Escambia County in January as the All State Band performs in Tampa. Heintz was the only 11th or 12 grader in Escambia County to make the auditioned band. 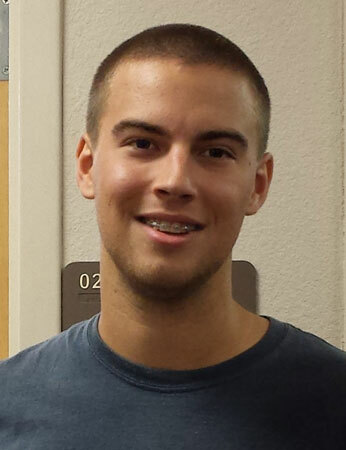 Heintz is a top academic student at Tate with a 4.85 GPA and was recently named the October Student of the Month. Submitted photo for NorthEscambia.com, click to enlarge. The ECUA’s sewer averaging period begins with each residential customer’s first meter reading on or after November 15, (including ECUA sewer customers whose water service is from another water provider such as Peoples Water Co.). The length of each customer’s sewer averaging period is 90 days. Annual sewer charges are based on the average number of gallons of water used in a household during the sewer averaging period. Conserving water sage during this time helps residential wastewater customers impact their sewer rates for the coming year in a positive way. It is important to check all indoor and outdoor plumbing fixtures for leaks. Leaks will end up affecting your monthly water and sewer charges. For more information on ways to conserve, visit the ECUA website at www.ecua.fl.gov or call Customer Service (850) 476-0480. 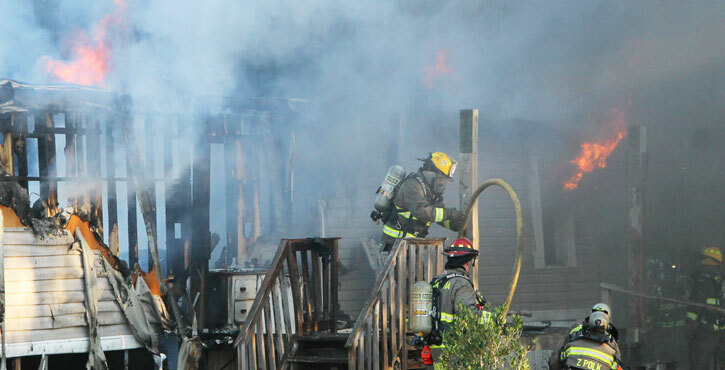 Four people were left homeless after fire destroyed their home Friday afternoon outside Century. The four — two adults and two teenagers — were not at home when fire broke out in their mobile home in the 3000 block of Highway 4A just after 3:00. 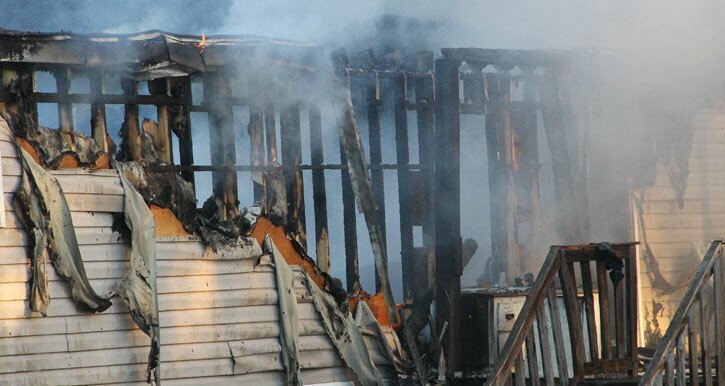 The mobile home was fully involved when firefighters arrived. 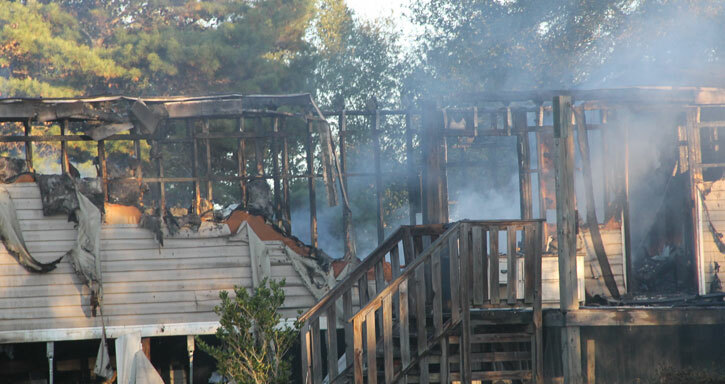 The cause of the fire is under investigation by the Florida State Fire Marshal’s Office. There were no injuries reported. The American Red Cross will assist the family with their immediate needs and a place to stay for the next few nights. 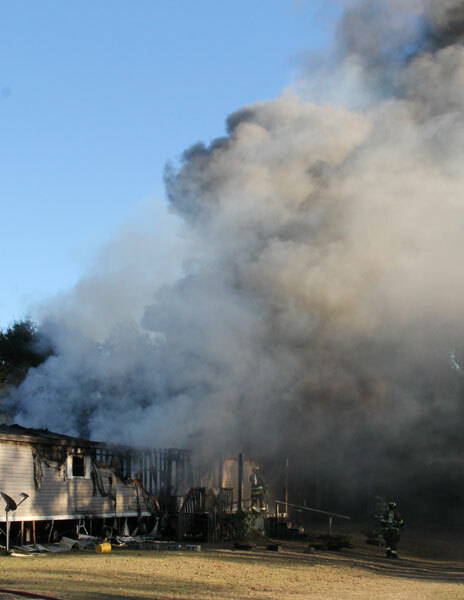 The Century and McDavid stations of Escambia Fire Rescue, the Flomaton Fire Department, the Jay Fire Department, Escambia County EMS and the Escambia County Sheriff’s Office responded to the blaze. NewRadio 1620 will broadcast tonight’s Catholic Crusaders vs. the Clay Blue Devils playoff game for the Region 1-5A Championship. Pregame will begin at 6:15 Pensacola time and the kickoff is 6:30 with play-by-play announcer Jeff Knox and color commentator Bennett Traylor live from Jacksonville. 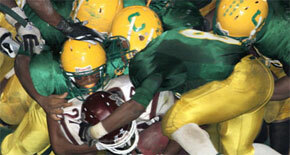 Catholic beat the West Florida Jaguars 26-20 last Friday to advance to tonight’s regional playoff game.